The "inappropriate nocturnal use of lab equipment in the name of alternative science experimentation / communication" badge. The "my degree inadvertantly makes me competent in fixing household appliances" badge. One I would like to see is a "successfully salvaged lab equipment from a dumpster" badge, just remembering some of my proudest moments. 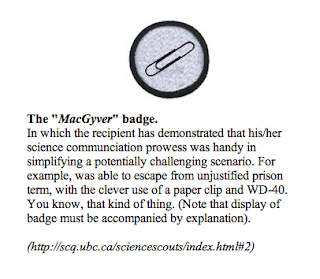 I think there should be a badge for those of us who live with crazy MacGyver people! The Queen Mother might be convinced to have one of her knaves embroider an appropriate item of clothing with this patch.